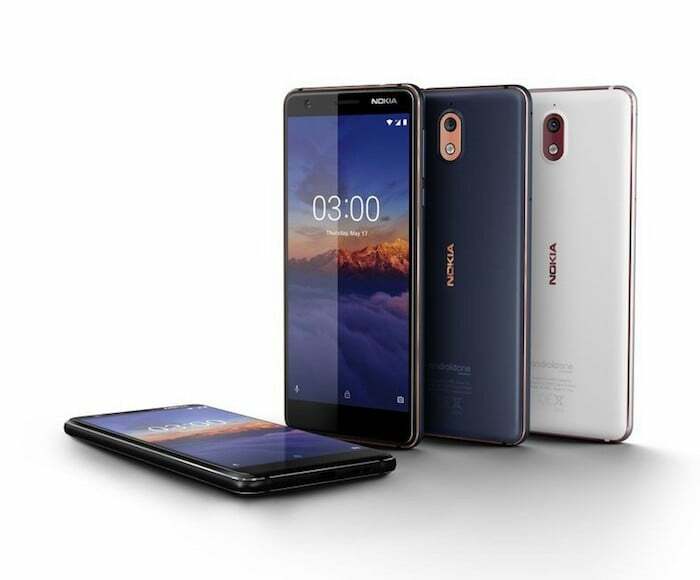 In a not-so-surprising move, HMD Global, the new home of Nokia smartphones has announced the upgrades to last year’s Nokia 3 and Nokia 5 devices, dubbed as Nokia 3.1 and Nokia 5.1. Like HMD announced at the MWC 2018, all the Nokia smartphones will be part of Android One program, it doesn’t change with the Nokia 3.1 and Nokia 5.1 too. However, the surprising move is the company chose a MediaTek processor for the Nokia 5.1, after everyone being expected it to come with the Snapdragon 450 chipset. The Nokia 5.1 is powered by the MediaTek Helio P18 SoC, whereas the Nokia 3.1 gets the MediaTek MT6750 chipset. Let’s find out what improvements HMD has made in the new phones. HMD Global stated that the Nokia 3 is the company’s best-selling device to date, of course, it’s understandable because the device went on for sale much earlier than other handsets. And everyone jumped on the smartphone because of the Nostalgia factor. In 2018, the company’s coming up with Nokia 3.1 with key upgrades on board and double the cores. Like every manufacturer, HMD also went with an 18:9 display for the Nokia 3.1. The phone sports a 5.2-inch HD+ display carrying a resolution of 720 x 1440 pixels. The phone is powered by the octa-core MediaTek MT6750 chipset with all the eight cores clocked at 1.5GHz. HMD says the performance is boosted by 50% on the device, thanks to the octa-core processor. The design of the smartphone remains unchanged. It has the same polycarbonate body with aluminium mid-frame, same as the original Nokia 3. And yes, the Nokia 3.1 also lacks a fingerprint scanner. The chipset is mated with 2GB/3GB of RAM and 16GB/32GB of onboard storage. A microSD card slot helps in expanding the storage. Optics wise, we have a 13MP camera at the back, followed by an 8MP unit on the front. The phone has support for Wi-Fi, Bluetooth, GPS and 4G LTE. It runs Android 8.1 Ore out of the box and is backed by a 2990mAh battery. As always, HMD Global released different colour options of the Nokia 3.1. The device comes in Blue/Copper, Black/Chrome, and White/Iron options. The base variant with 2GB of RAM and 16GB of storage is priced at €139 (approx. Rs 11,120) and the 3GB RAM variant with 32GB of storage is priced at €169 (approx. Rs 13,521). Both the variants will be available in June. Coming to the Nokia 5.1, it’s a mid-range smartphone with specifications slightly less powerful than the Nokia 6.1. 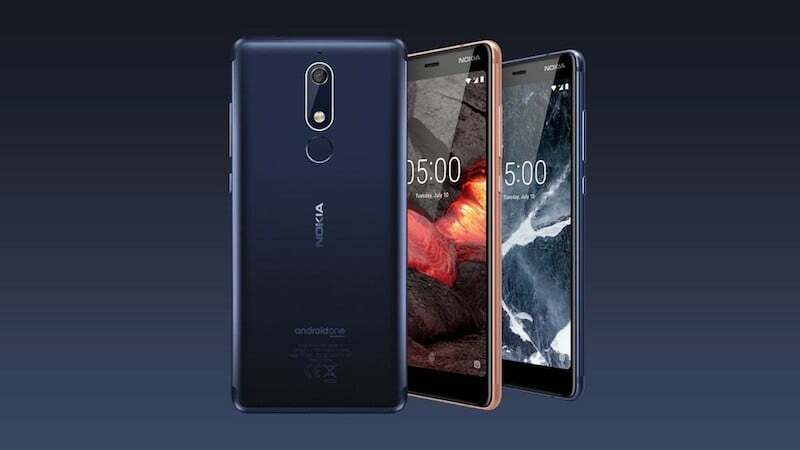 The Nokia 5.1 has the similar design as its predecessor; It is constructed out of series 6000 aluminium and HMD claims the phone as one of the most durable one in its price range. Thanks to the usage of 18:9 display on the front, the fingerprint scanner has been moved to the rear, same as the Nokia 6.1. The Nokia 5.1 has a 5.5-inch display, and it’s a Full HD+ panel. The display has a pixel density of 443 PPI and a 2.5D curved glass is also present on top. One of the key changes in the Nokia 5.1 is the processor. HMD Global has gone with the unannounced MediaTek Helio P18 processor, which is an octa-core chipset that’s claimed to deliver 40% better performance than the Snapdragon 430 chipset seen on the Nokia 5. The chipset works in tandem with up to 3GB of RAM and 32GB of internal storage. Cameras in the smartphone include a 16MP unit at the back, which now has support for PDAF and dual-tone LED flash. Up front, the 8MP sensor remains the same. The phone has a relatively smaller 2970mAh battery and it also comes laden with Android 8.1 Oreo out of the box. Connectivity options in the Nokia 5.1 include 4G LTE, VoLTE, Wi-Fi 802.11 b/g/n, Bluetooth 4.2, GPS and NFC (in select markets). 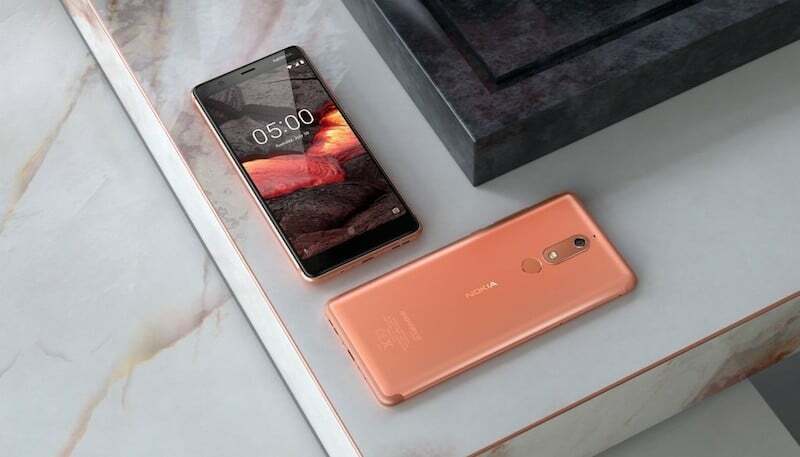 The Nokia 5.1 will also be available in three colour options- Copper, Tempered Blue, and Black. The base variant is priced at €189 (approx. Rs 15,122), while the 3GB RAM variant goes for €219 (approx. Rs 17,522). Nokia is robust and powerful device which is powered by ediatek chipset! HMD management are the biggest idiots I’ve ever seen… To have mediocre Mediatek processor on Nokia is like the biggest screw up of all time! Nokia is going to the biggest failure for the second time! @sanju HMD/Nokia’s sales figures beg to differ with your assessment. @dragonmonk Can you share the sales figure of Nokia for India (App 2017-March 2018), so that your false claim can be debunked and exposed! Nokia last year had just one Mediatek based model under Rs.15,000. This year it’s almost all models are gonna be Mediatek. Let’s talk after one year… to see how badly they are gonna be screwed up! @sanju You are welcome to check the sales numbers yourself if you want to “debunk and expose the false claims”. Coming to your claims, number of phones using mediatek processor this year are two, not ‘almost all’. Having said that, it’s not true that Qualcomm = good and Mediatek = bad by default.